Please read all information carefully. Click on each plus sign for more information. If you need to change your major, entry term, or address, it is in your best interest to update this as soon as possible. If you met the Priority Registration Deadline, please contact the college of your new desired major so an advisor can change your major. Phone numbers for each college can be found at auburn.edu/academic/provost/academic_advising/advisingList.php. Please note that if you change your major after October 1st/March 1st, your registered scheduled will not be changed by your advisor. You will be responsible for making any schedule changes once your time ticket opens after SOS. If you did not meet the Priority Registration Deadline, please call the Office of Admissions Processing at (334) 844-6429 so they can change your major. Please make all major change requests as soon as possible. Waiting until SOS could affect your registration or class schedule. To change your entry term or address, please alert Admission Processing at 334-844-6429 as soon as possible. Your user name and password are important pieces of information. Before leaving home, please make sure you know both of these and can successfully log into AU Access: auaccess.auburn.edu. You must complete your Financial Obligation Agreement before registering for classes. You can complete this agreement before coming to SOS by logging in AU Access ("My Academics" tab, then click the "Student Records" section, then click the "Financial Obligation Agreement" link). Upon acceptance to Auburn, students are placed on hold by the AU Medical Clinic pending your submission of required immunization records. If you have not submitted your Medical Information Forms to the Auburn University Medical Clinic through the Med+Proctor portal, please do so as soon as possible to clear the hold permanently. If you are unable to fully complete the Medical Form, by the time you attend SOS, please see the next section - Complete an electronic Letter of Understanding to clear your Medical Hold temporarily. In order to clear the medical hold temporarily to allow for course registration, you should complete an electronic Letter of Understanding (LOU). You may access the LOU in AU Access (“My Academics” tab, then click the “Student Menu” icon, then the “Temporary Waiver of Medical Hold” link). Completion of the electronic LOU will grant a temporary exception to the medical hold to allow you to register for classes. The Medical Information Form must then be submitted via Med+Proctor within 30 days of your SOS session. One of the key components of SOS is class registration. Registration occurs in the same system you logged into to sign up for SOS. Prior to attending SOS, make sure you review the following presentation to familiarize yourself with how the system works. View the video here: AU Access Video. You will receive a detailed schedule when you check in at your session, however we also encourage you to utilize Auburn Guides, a mobile app containing the SOS schedule and other resources. Auburn Guides is Apple and Android compatible. To download the app, visit the App Store/Google Play, or go to guidebook.com/g/auburnsos. Blackberry and Windows phone users may also visit the previous link for a web version. You can find more information about uploading your photo for your Tigercard here. Please pay close attention to the Photo Guidelines listed. Photos that do not meet the requirements will not be accepted. If your submitted photo is accepted at least three days prior to your SOS session, you may pick up your Tigercard at your session. Register your emergency contacts at auburn.edu/emergencycontacts. You will need your AU user name and password to log in to the page. You will then be prompted for your cell phone number for emergency alerts (AU ALERT) and contact information for your parents and/or others you want notified if you’re involved in an emergency or crisis. 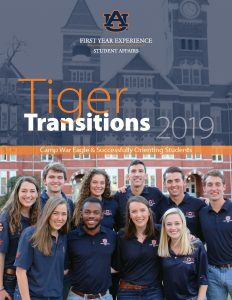 Advisors, university staff, and the First Year Experience Office may be contacting you with important information through your Tigermail account prior to your SOS session. You will also be receiving your first tuition bill by email in mid-April for the Summer term, mid-July for the Fall term, or November for the spring term. If you do not pay the first bill by the deadline, your classes are subject to being dropped regardless of if you have attended SOS or not. If you are interested in on campus housing, visit auburn.edu/housing. If you are interested in off campus housing, check out offcampushousing.auburn.edu/ for information about local housing options or you can search online for various Auburn apartment guides. Please remember your: SOS parking pass, comfortable clothes and shoes that are appropriate for walking around campus, an umbrella or rain jacket in case rain is in the forecast, a photo ID in order to have your student ID card made. Student and Guest check in is from 7:45 to 8:15 am Central Time in the Auburn University Student Center. Please plan to arrive between 7:15-7:45 am. You will be directed to park in the Stadium Parking Deck (adjacent to Jordan-Hare Stadium). You will then be directed to the Student Center where most of the orientation session will be held. Check out this page for a campus map and driving directions to the Stadium Parking Deck. Your day should conclude at approximately 4:00 pm for the sessions in March, April, May, and November. In August and January, the sessions will conclude at approximately 2:00pm. Please plan on staying the entire time. Attendance is mandatory for all parts of the SOS day through academic advising, and if you do not attend all of the meetings scheduled, you will not be cleared to register for classes. You will be allowed to attend SOS at a later date. There will also be a separate parent/guest program that runs concurrently with the student program. If your parent/guest would like to attend but has not yet registered, please call our office at 334-844-4501. Please note that there is a $50.00 per guest fee. That fee will be charged to your student account. If you have questions or run into problems, contact the Medical Clinic at 334-844-4416. You will register for parking on the My Campus tab of AU Access. They are here to help you so reach out if you have any questions. Communication increases as you get closer to the start of the term. You do not want to miss any important information.